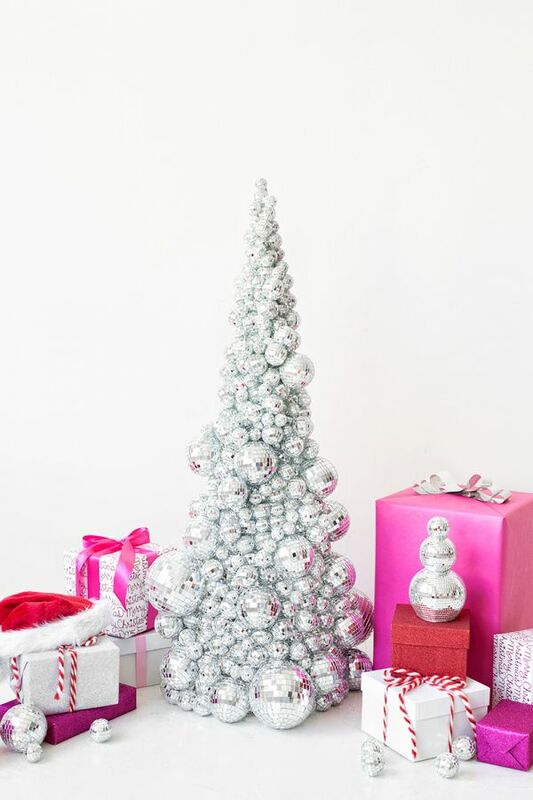 Skip the regular evergreen tree and do something different this year by having a disco ball Christmas tree. You can get ready tonight for the holiday season by creating a spectacular shimmering Christmas tree by hot gluing disco balls in a variety of sizes onto a wire cone frame to make your own disco ball tree to decorate your home this year. Use small disco balls to make your photo holders that you can clip one of your favorite pictures to the top. This simple DIY project is easy to make and can be used to decorate your desk year round. Combine a silver garland and lots of mini disco balls to make a fun sparkling wreath for your front door that is perfect to decorate the exterior of your home leading up to Christmas and right into your new year's celebrations. This year skip the standard stuck on gift bow and improve your gift wrapping by tying a few mini disco balls to the top of your gift instead. When completed your collection of wrapped gifts with mini disco balls will reflect the Christmas lights from the tree they are below filling the room with beautiful reflected light on the walls. Carefully cut off the top of a large disco ball to turn it into the perfect vase for floral centerpieces for your Christmas dinner or New Year's Eve celebration. With just a few steps you can make regular store bought flowers seem extra grand by placing them in this beautiful DIY vase. It is not too early to start planning on what you will wear this New Year's Eve. No matter if you are heading to a party, to New York City to watch the countdown live, or spending the night in at home with your family watching the countdown on TV this sparkling DIY disco band headband is a great way to add some festive flair to your outfit! Give yourself somewhere to display all the holiday cards you receive this year by cutting a piece of cork into a Christmas tree shape and turning mini disco balls into pins to hold your cards to the wall. Year after year during the holiday season you will want to use this clever holiday DIY to display all your cards on a wall in your home. Convert small disco balls into mini planters that can work as place cards to help your guests find where to sit at your holiday-themed dinner party this winter. The sparkling place cards are an easy way to decorate your table with several mini plants and can double as a party favor too that the guests can take home with them. Combine together a small, medium and large sized disco ball to make your own disco ball snowman for a modern twist to the traditional snowman decor over the Christmas season. The completed snowman can then be used to decorate anywhere around your home, from your fireplace's mantel, as your table's centerpiece to under your Christmas tree, or wherever you want a bit of extra sparkle. Get ready for New Year's Eve countdown by making a large disco ball pinata to keep all your party guests entertained as they take turns trying to hit the pinata while blindfolded once the clock strikes midnight! Leading up to midnight the handmade pinata can be hung high on the ceiling and makes a great way to decorate for your party. Pick up a bag of mini disco balls and string them together to make the perfect holiday garland for both Christmas and New Year's Eve that you can use for decorating your fireplace mantel or draped around your Christmas tree. Set the stage for your New Year's Eve party this year by making a dramatic disco ball-inspired photo backdrop wall to decorate your party. This amazing backdrop is sure to be a hit with your friends, with all of them wanting to take selfies or group pictures next to the sparkling wall as they celebrate throughout the night to post on Instagram or Snapchat. Transform a regular paper lantern into a multicolored disco ball perfect for decorating your home for New Year's Eve by using a circle punch to create 140 paper circles in various shades of mercury glass paper to cover the lantern. Hang the completed ombre disco ball at the center of your cleared out space for the party's dance floor or over the food and drink table to decorate your home for the party. Combine a variety of different color and sized disco balls onto a wire wreath for a multi-colored disco ball wreath that is perfect to hang on a wall in the interior of your home this holiday season. Even after the holidays are over this DIY disco ball wreath can be reused to decorate for any celebration, from birthday parties, baby showers, weddings or even anniversaries as every party can always use some fun sparkling disco balls. Surprise everyone at the New Year's Eve party you are going to this year by arriving dressed up as a disco ball by making your own costume! This clever project is sure to have you wearing the most festive outfit out of everyone as you celebrate all night long with your friends. Tonight break out the glitter and make your own disco ball-inspired decor by covering a paper lantern completely in glitter. When hung the glittery lantern will reflect light on the walls just like a disco ball and by making your own large glitter disco ball with your leftover jar of glitter you will save money by DIYing one compared to buying a large disco ball for your party. Make your own disco ball-inspired ornaments to hang on your Christmas tree or around your house this holiday season by covering a foam ball completely in glitter to add some extra sparkle to your home's decor this winter. Keep your helium filled inflated balloons from floating away this New Year's Eve by tying them down to a disco ball that will serve as a weight for the balloons instead of using one those ugly balloon weights sold in party stores.